Sequels are tricky affairs; how much do you want them to be like the original or are you looking for new twists? Roads of Rome 2 treads on familiar territory. It's a continuation of the charming love story between you (as soldier and super builder Victorius) and Caesar's daughter. 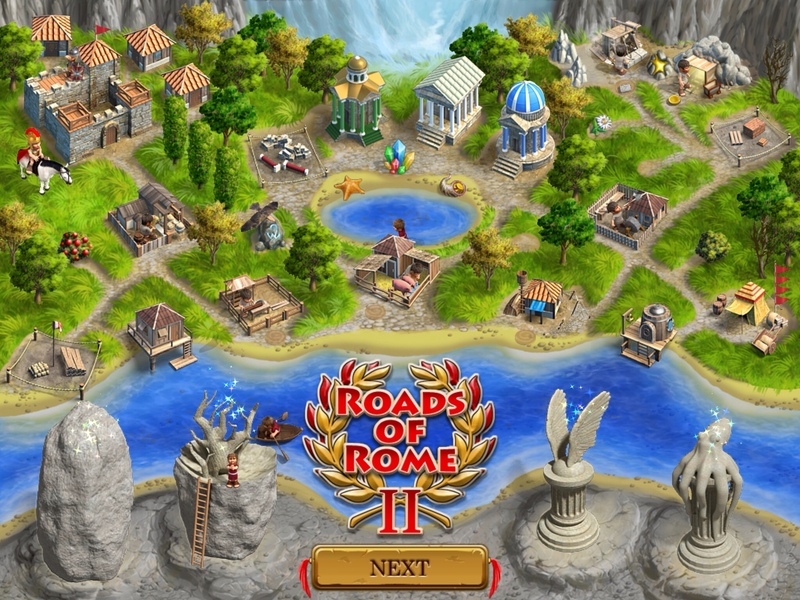 This time, Caesar's fallen ill and your mission is to … build roads to save Caesar's life. Of course, road-building isn't really that remote from the rise of Rome; it was in fact, a big part of why the Roman empire became successful. 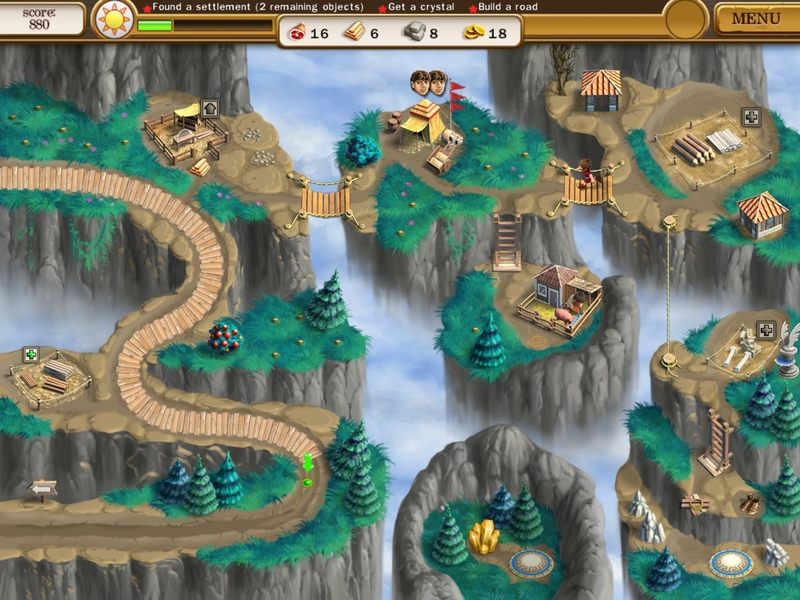 When it comes to time management (TM) games, it seems that we want more of the same. Perhaps it's because TM games operate on familiarity of routine and efficiency, and that's why the sequel comes as more of the same (familiar) fun we TM addicts love. Roads of Rome 2 builds on the original (literally and figuratively) and turns it into something better. Yes, it's the familiar game mechanics all over again – you clear debris, set up construction mills, gather crystals, meet specific level objectives such as making offerings to the gods and building settlements. Along the way, there are animals that scare your workers that you need to get rid of by tapping continuously. There's also a nice section where you get to see your accomplishments and the status of your upgraded construction mills, called “My Valley,” as you can see below. The fun part of the game is figuring out how to maximize your time (aim for expert marks all the way!) with limited resources. 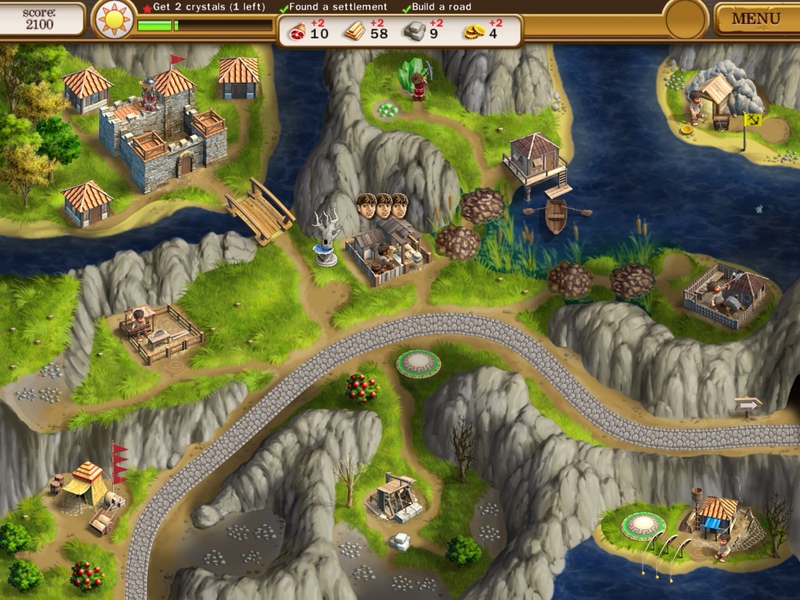 See, your resources are linked together – you need food to be able to build and clear debris; and to clear debris, you need food and gold; now to have enough resources, you need to build sawmills, pig farms, gold mines, and other construction mills. 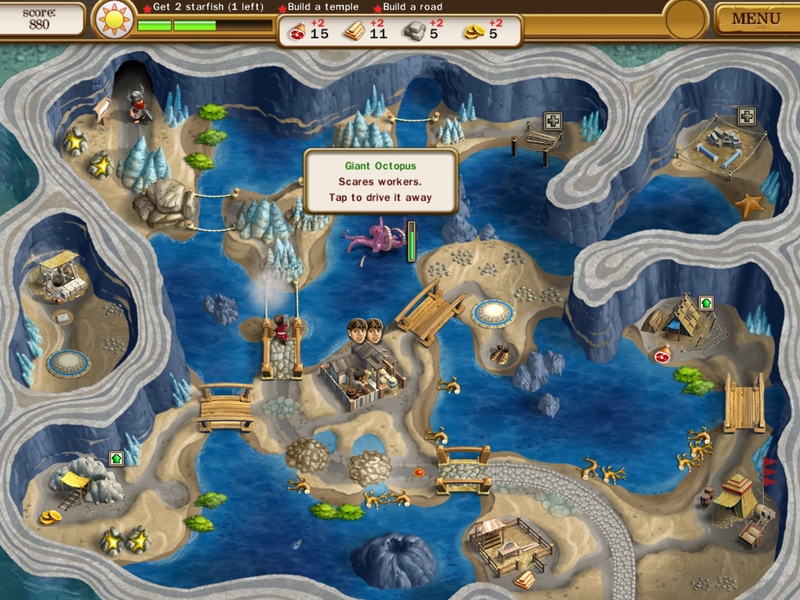 Given the limited time within which you need to complete level objectives and build a road, it's once again a frantic game of strategy and efficiency. Power ups are eventually introduced to help you along under pressure, but I find that these are too short to be really maximized efficiently. Roads of Rome 2 is even gorgeous than the original, with little touches of animation animating the background on top of the cute animated workers who run around doing various tasks. The locations are pretty nice and diverse, corresponding to the different elemental goddesses who may help Caesar if you make offerings to them. I particularly like the music and sound and turn it up just a little louder than usual while playing. One more reason to love Roads of Rome 2 – apart from the fact that you can pick it up for under $2, it's universal, meaning you only need to buy once for your iPhone and iPad – a rarity for time management games of its type and calibre. 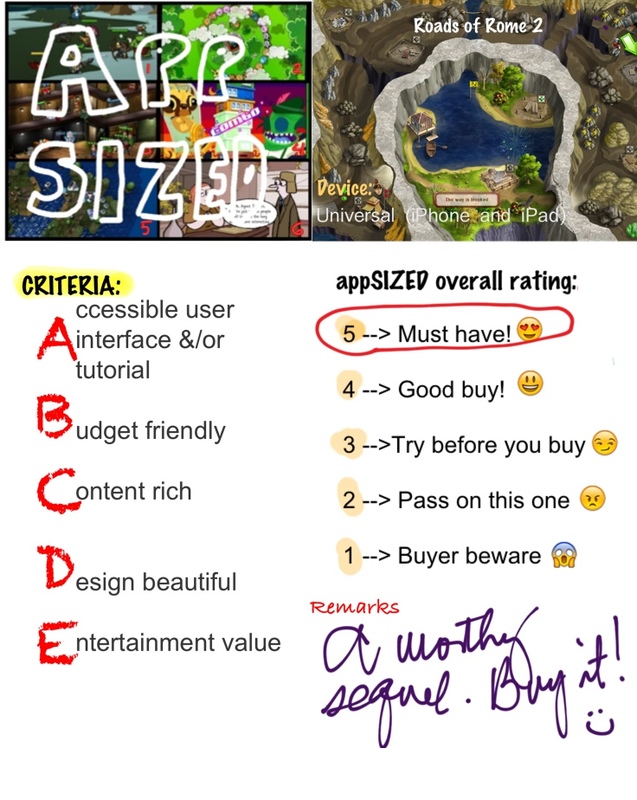 With about 40 levels with stunning visuals and solid gameplay, even its regular price is a steal. In fine, Roads of Rome 2 comes highly recommended, so don't miss it! I’ve seen that game but it never really interested me. You’ve made me consider trying this out.